“The poet Michael Harper once told a story that I wouldn’t be so quick to dismiss as apocryphal, about a man from iowa who became so transfixed by the three numbers on side one of Kind of Blue— “So What,” Freddie Freeloader,” and “Blue in Green”– that he never got around to flipping the record over to hear “All Blues” and “Flamenco Sketches.” He once told Harper that Side One was so profound that he was afraid that Side Two would be a letdown. I wonder if this Midwestern mystic ever noticed anything awry about those three tacks as he listened to them over and over. They were made at the first of two recording sessions, during which an undetected problem with the speed of one of the tape recorders resulted in a quarter-tone sharpness in pitch. For decades this mistake bedeviled inexperienced musicians who tried to play along with the tracks, sheepishly blaming themselves when they ended up in another key. 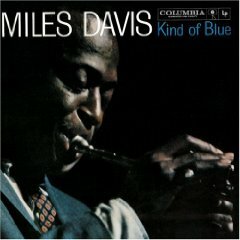 For the rest of us, this tonal ambiguity actually worked in the album’s favor, creating the seductive illusion of music that inhabited its own dreamlike space (nothing on Kind of Blue is taken very fast, and even the medium-tempo numbers seem to be floating in slow motion). ← Was Stanley Kowalski the man Alicia Keys had in mind?